#ac0009 - Gamesounds is a Super Rare remote wireless headphone headset for the original Nintendo Entertainment System (NES), that doubles as a FM Radio. For collectors, the price for these can only go up since there are only a few factory sealed Gamesounds NES Remote Headphones headsets out there and they get rarer every year. This specialty item is manufactured by Light Wave. This is a very "very" rare factory sealed collectors item. 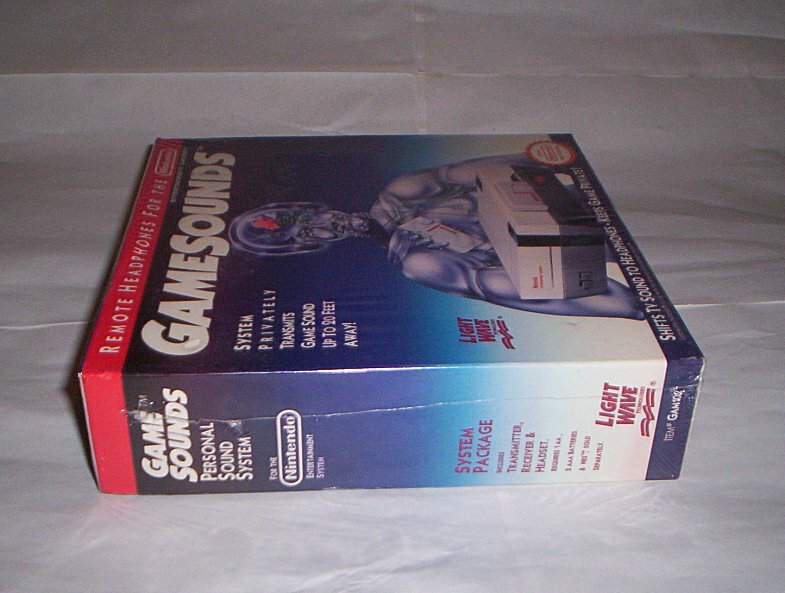 The Gamesounds remote head set manufactured exclusively for the Nintendo Entertainment System (NES) is a genuine new in box (NIB), shrink wrapped, excellent condition and has a rarity rating of 9+/10. You will be hard pressed to find these anywhere "even used," much less factory new. This is an official Nintendo Licensed head set device that connects to your NES’ AV ports. With this accessory, you'll be able to hear Mario squash the Goombas, but no one else will...Keep the peace in your home with gamesounds. Receiver hears game 20-30 feet away. With this little beauty, you can keep the battles on your TV, not in your family room! Want to play in a room while others read or do their homework? No problem. Just slip on game Sounds headphones. They let you turn TV volume all the way down, so no one hears the sound but you. want to play with a friend, or two, or more? No problem! Just add-on extra receiver packages at any time. each gamesounds system package (item #GAM102 -This package) contains one receiver and one transmitter. When you add-on extra receivers (item #GEX103), no extra transmitter is needed. And you can add as many receivers as you like, because gamesounds work cordlessly. So there is no crowding around the TV. With this Gamesounds NES Remote Headphones Set you will say that NES gaming was never this much fun. Gamesound's Receiver also doubles as an FM "walkman"--style radio! Use it when not playing games!! !